With the ushering in of global economy, people have started flying in a big way to various parts of the world. The many airline companies offer you attractive terms, competitive rates and and other captivating features to lure business. You need to check out what the various airline tickets have to offer before finally deciding on the one you want to use. Be it business class flights or a holiday trip, choosing the right airline for traveling is important, if you wish to avoid needless anxiety and stress. Once you know your travel destination and have decided how to reach there, it is time you choose the right airline for flying. There are a plethora of airline companies – each offering different types of features and services and at varying rates. You can contact your travel agent and obtain all the required information, or more preferably, sit in the comfort of your own home/office and ferret out the information direct from the Internet. Flying has today become commonplace and no longer considered unsafe or more risky than any other forms of transportation. Nonetheless, the awareness that you are going to be traveling at an altitude of thousands of feet above the ground can make a traveler nervous. Please know, if you are not already aware, that all airline companies have a safety rating and it will be prudent to avoid airline companies that do not enjoy a sound air safety history. Of course, it is necessary that you have certain minimum travel comfort while flying – more so, if it is a long journey. You should have fairly capacious seats with ample leg space for stretching. Again, the services provided by various airline companies vary widely. For a long distance trip, make sure that the food served is of good quality and served promptly on board the airline carrier and that the flying charges are all-inclusive. When planning to go on vacation it is worthwhile to take full advantage of baggage allowances as you can bring home certain utility items and gifts for your loved ones. Please note that the baggage allowances vary with each airline and it is best to choose the airline that provides maximum baggage allowance. Needless to say, cost is a key factor and you should opt for an airline that offers competitive rates without denying all the standard facilities. Your aim should obviously be to identify the most cost-effective way to reach your destination and returning home safely. Some suggest that you should use only the airline with which you are most familiar rather than experimenting with less known airline companies – regardless of the fares and other features. Staying with the same airline may be a worthwhile idea if the airline company has the right frequent flyer program and lets you to earn or redeem airline rewards and also enjoy elite status. 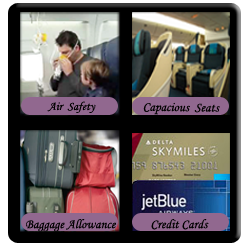 You may be already aware or enjoyed the benefits of airline reward credit cards. The basic idea of most airline reward credit cards is they allow you to earn points and redeem for your next vacation travel. There are essentially two types of airline reward credit cards - airline-sponsored credit cards and bank sponsored credit cards. When it comes to choosing the right airline company for traveling, you should accord priority for safety and comfort factors rather than some monetary gains in whatever form.